Treadmill iPad Stand: a heavy duty stand that lets you read, watch movies, and even make video calls when exercising. It is adjustable from 46″ to 73″ high. SwingHolder for iPad: a versatile iPad treadmill stand compatible with iPad 1, 2, 3, and 4. You can charge and sync your tablet while it is in the SwingHolder. The stand supports many viewing angles and positions. Treadmill TV Stand: this can not only hold your tablet but also laptop or TV. You will need a portable iPad stand to use this. It can be adjusted from 46″ to 73″ high. This heavy duty stand will last you a while. We have already covered exercise machine mounts for the iPad and Kindle in the past. 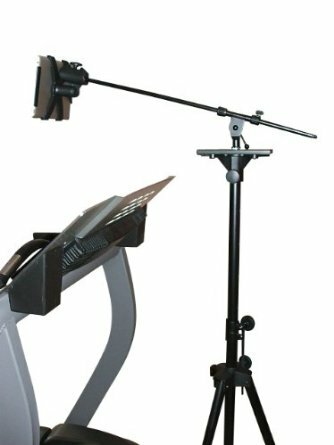 These stands are more useful as they do not move while you push yourself hard on your treadmill. They make it much easier to read while exercising. Previous story Amazon Building an Android Video Game Console?